Treat your loved ones, family, friends or colleagues to a pampered stay in one of our beautiful Canmore Bed and Breakfast Homes. It makes a perfect Birthday, Christmas, Anniversary gift or even a special way of saying thank you!!! 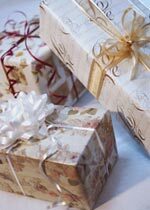 Watch for the Gift Certificate Logo as you browse through our website for the participating B&Bs. Listed below are the participating B & B's. Click on a link to see more about that B&B and if you would like to order a gift certificate, click the "Gift Certificate" icon on the right hand side of the page. You will then fill out a form that will be sent straight to the B&B. They will get back to you as soon as possible. Easy!! And don't forget to treat yourself too. Thank you for choosing a Canmore Bow Valley Bed and Breakfast Gift Certificate as the Special Gift for your Special person.